I’m sure that many of you have other wonderful suggestions so please feel free to add your ideas as a comment post at the end. 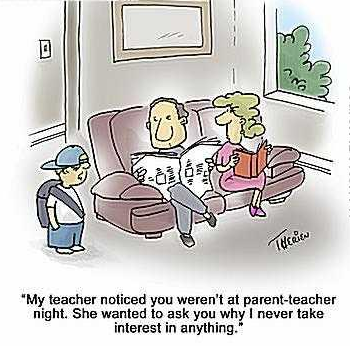 Keep in mind that in many cases the parents are more anxious about meeting you than you are of meeting them. In a secondary setting; this may be the first time they have met with a LOT of teachers (in the case of Year 7/8 parents – they may be used to meeting 1 teacher only in Primary). Ensure you make time for solid meal break – even if your timetable fills up. Dress professionally and wear your name badge. You should also have a name sign for the table you are sitting at. You might want to have a bottle of water on hand. Make a list of the things you would like to say and be prepared to write down things that the parent wants you to hear. You writing is a sign to parents that you are listening not just talking. Once you have your bookings – ensure you know the parent’s correct names. It is embarrassing for you to say “Hello, Mrs Jones” when the parent’s surname is different – the correction is an awkward start. A hint I heard the other day is that it is useful to know the occupation of the parent (gives you a starting point). Take the portfolios with you and a copy of your report comments/tick options/ marks book and program (don’t trust memory). Evidence speaks louder than opinion. Find a “line” to get you started or else you will waste time in chit-chat. Eg. “How did you feel about, Johnny’s report?”, “I’m so glad we have been able to meet – what would you like to know?” – obviously you must come up with something unique or the parents will see that we are all saying the same thing. These ones are mine so you will need to develop your own… only joking! Know the school’s assessment and discipline policy and have a copy handy to refer to. Don’t talk about other staff / classes that are not in your area of responsibility. Sit close to someone more experienced and don’t be afraid to refer to others DURING the interview. Alternatively, it is acceptable to say, “I don’t know – I will find out and get back to you.” Of course – you then must. Parent night is the night when your communication home up until that point blesses you. If you have phoned home (e.g. when a student performs poorly in a task) then you will be less likely to face an irritated parent. If the first notion that Johnny has not been performing well in your subject is from the report – you may have a fire to put out first. Stick to the policies you have in place for your school/department – resist the temptation to offer exemptions / promises etc. Be aware of what is already “on offer”. E.g. “My Tutor”, “Departmental Tutoring”, “Departmental Support Websites” etc. Also, for special needs, we have a Chaplain, Careers Advisor, etc. Again, don’t promise on other’s behalf but you may refer. Debrief – Self evaluate and be prepared to make suggestions on how the night could have been better for you / others. How are YOU tracking with the Australian Curriculum (AC)? We won’t offer any commentary yet, but we are interested to know where you feel the Australian Curriculum (AC) implementation is tracking for you; with the count down only 18 months away.